"Extra" caught up with Oprah Winfrey -- and she dished on rumors that she's bidding adieu to the small screen! "I'm a girl that keeps her word," Lady O told "Extra's" AJ Calloway. "I have a contract 'til 2011, so right now that's what I have until someone writes me another one... I'm going to fulfill my contractual obligations and fulfill them happily." Winfrey is still elatied over Barack Obama winning the White House. She was a strong Obama supporter in the early days of his campaign -- and can't stop smiling about his victory. "Yes I am, yes we did, yes I can! I can't get over it still." 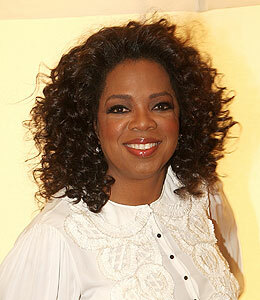 Reports have surfaced suggesting Oprah is planning a huge inaugural bash for Barack -- which she says is news to her! "Everybody's calling me about a party. I'm like, 'Isn't somebody else having a party? '...I don't know about the party thing yet... There is extreme party confusion. I'm trying to get to the bottom of it myself!"